Have you heard of Amigurumi? It is two Japanese words combined together to mean crocheted stuffed doll and you pronounce it Ah-me-goo-roo-me (glad to see my two years of high school Japanese are finally paying off!). It’s a bit difficult to remember and almost impossible to type correctly into Google so maybe we will see a good nickname develop for in the next few years (please!). And of course they have to be cute. Think Hello Kitty and other cute Japanese cartoon creatures made out of crochet. More often than not they are animals, but they don’t have to be. Best of all, if anyone in your family has a favorite character, chances are there is a cute free pattern so you can delight them by making them one! The "Throwing of the Bouquet" is a fun tradition that a lot of brides like to include as part of their wedding. But some brides are reluctant to part with their beautiful bouquet after only a few hours. The solution is to get a throw-away bouquet made. 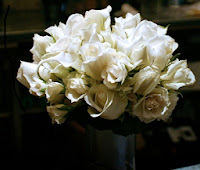 This is often a smaller, simpler version of the bride's bouquet. The bride can then take her own bouquet home and enjoy it for a bit longer, and the lucky catcher gets a nice memento to take home as well. But before ordering a throw-away bouquet, have a think about whether you will be around to enjoy your bouquet. If you and your new hubby will jet off on an amazing overseas honeymoon, chances are you won't be taking it with you, and when you get back it will no longer be at its best. So consider saving the cost of a throw-away bouquet and really make the day of the lucky catcher!